We need your help for this old gentle soul. Meet Diego the gentle soul of a Donkey. Diego has had a long lifetime of neglect, so we want to make his life good and give him his health back.....its a long costly road. Diego was pulled from a kill truck by our friend Casey last summer and we then took in as his lifetime of neglect was going to need a lot of time and money. His feet were crumbling from founder, you could take off pieces with your hand. He has such terrible founder, his coffin bone is turned and flared - but we think we can get past this, we know we can. He was covered in lice and big areas of fur were coming off with lice eating away, but now his coat shines bright. He was skinny and bony, but now hes eating better and gaining weight. His feet had been trimmed so short - that one more scrape on his soul would have revealed bone. His feet also had fungus called thrush in them, but now bit by bit we are getting both under control..... it is slow. He is a challenge But that gentle look in his eyes, we know we have to keep on helping him. We knew it was going to be a long haul - hoof issues and founder always are. But then a new development - he has odd wounds on his hocks. We have been treating with our veterinarian's assistance for months - nothing helps. There is something in his system that is not responding to antibiotics. We need to find answers. 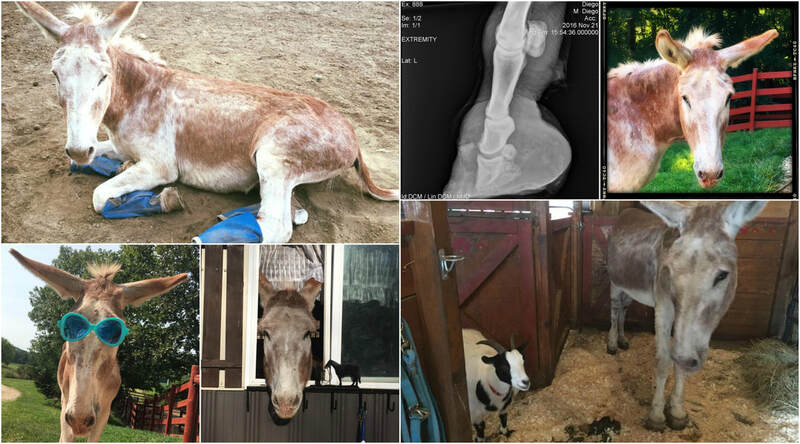 We hope that if we can figure out what is going on in his system so his hocks will no longer hurt. When his hocks feel better he will stand on his front feet more soundly and the founder and pain will go away - and with healthy hoof growth and special shoes - he can be sound again. Why bother you ask - why not put him down??? You just have to pet him once - look into his big dark eyes, rub his massive dopey ears and know - He wants to live - he doesn't want to leave yet. So as a rescue - I must give him more chances - I must take him to the University of Illinois Veterinarian Hospital to find answers. He's that special. I'm a one woman show with a full time job and have many animals under my care. This cost will be significant but what type of rescue wouldn't try with all their heart - and just hope funds will come and save us. We have $408 to our name and food, vet, supply bills are coming in - so we need to really work at a special fundraising effort. We were short on funds before we took on this monumental task of saving Diego at the U of I but we know things must work out for all of us...... when you work from the heart - miracles happen. If you want to help us with Diego - all donations are 100% tax deductible as we are 501(c)3 registered non profit. PayPal "GIFT" at 2ndHRR@gmail.com or use the easy button down below. Even $5 will be a big help!!! Together we can do this!